Davenport, population 294 (2010 Census), is located at the juncture of central and southeastern Nebraska in the northwest corner of Thayer County and is bordered by Fillmore County, population 6,634; Nuckolls County, 5,057; and Clay County, 7,039. Our local trade area covers large portions of four counties and includes the towns of Edgar, Oak, Ong, Shickley, Carleton and Nelson, as well as Superior, Deshler, Hebron, Bruning, and Geneva. We are 100 miles from Lincoln, 165 miles from Omaha, 70 miles from Grand Island, 50 miles from Hastings, 80 miles from Kearney, and 60 miles north of Belleville, Kansas. Our Thayer County seat is 25 miles east and south of us at Hebron, Nebraska. 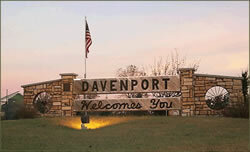 Davenport is in a very fertile agricultural area with ample water supply. Agricultural concentration is generally on cash grain crops and livestock. Two north/south highways, US Highway 81, 13 miles east of Davenport; and Nebraska Highway 14, 14 miles west, serve Davenport. Nebraska Highway 4, along the south edge of town, is an east-west thoroughfare. Airports serving this region are located at Hebron , 25 miles; Hastings, 50 miles; Lincoln, 100 miles; Omaha, 165 miles; and Kansas City, 233 miles. Union Pacific Railroad serves the Davenport area with approximately 50 freight trains traveling through Davenport daily.